The method that's helped thousands in the U.S. and Japan learn Japanese successfully. The Japanese language has two basic writing systems, hiragana, and katakana, in addition to the one that uses Chinese characters or Kanji. 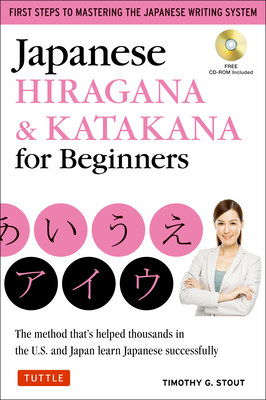 This handy book teaches you a new mnemonic-based method to read and write the fundamental 92 hiragana and katakana characters. Along with its sister book: Japanese Kanji for Beginners it provides a complete introduction to written Japanese. Memorable picture mnemonics help you to learn the characters by associating their shapes and sounds with combinations of images and English words already familiar to you. Clear examples and engaging exercises offer opportunities to read, write, use and practice all 92 primary hiragana katakana characters, plus the remaining kana that stand for more complex sounds. Polish your knowledge with word searches, crossword puzzles, fill-in-the-blanks, timed recognition quizzes, and other engaging activities. The CD-ROM allows you to print out flashcards (featuring the same mnemonic images taught in the book) to help you review and practice, even while you are on the go.